There are an increasing number of ways in which time and attendance or clocking in data can be collected. RFID proximity terminals have been around for a while, but more organisations are now choosing biometric terminals for employees to clock in and clock out. We offer a range of RFID and biometric time attendance system clocking in terminals to suit the way you want your system to work. We’ll talk you through what clocking in options you’d prefer to use and the types and cost of terminals. We’ll then configure the terminals to work with your time and attendance system. Biometric terminals are a simple way to stop ‘time fraud’ and ‘time theft’. Time fraud includes ‘buddy clocking’ where one employee clocks in for another. Time theft is where employees round up time worked or ‘guesstimate’ start and finish times. Fingerprint terminals are proving particularly popular. 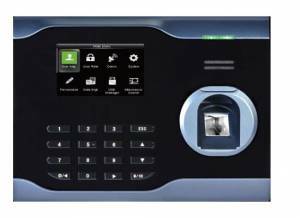 We find a lot of hotel and facilities management customers choose fingerprint clocking in terminals for their biometric time attendance system. To set up an employee on the system their fingerprint or prints are scanned-in and the system creates unique codes related to the prints, the code or codes are then stored. When the fingerprint is subsequently scanned as an employee clocks in, the system compares the print to the stored code. The fingerprints themselves aren’t stored on the biometric time attendance system which means there are no personal privacy issues. There are a number of different ways in which face scanning algorithms are calculated, most commonly the key points of a person’s face are triangulated and turned into a unique code. When the face is scanned at clocking in it’s compared to the stored algorithm for that individual. A 3D scan of the contours of a hand is made. The terminals don’t record or store palm or fingerprints. Hand scanners are often used where fingerprints might be worn, for example in some manual trades, or where people are in and around water or dirt a lot of the day. In our experience it’s often a good idea to inform employees about the way biometric terminals work when installing a new time and attendance system in order to allay any fears they may have over personal privacy or security issues. Radio Frequency Identification (RFID) has been around for a while. You’ll have come across it if you’ve had a pet microchipped, the vet uses a reader to view the information contained on the chip. Like a pet’s microchip the card or fob an employee carries for clocking in and out is a passive transponder which comprises a microchip with unique information stored on it, and an antenna. When the cards or fobs pick up the signal from the clocking in terminal (reader) the information is passed over. The exchange of data between terminals and cards or fobs only normally occurs within a close radius (or proximity) of each other. Many of our manufacturing customers still prefer swipe cards or proximity fobs (which can also work with door access control). Timed download from a service running on the server. Timed download from the ‘Watch Screen’ which periodically downloads the terminals and updates an ‘Employees Present’ indicator. Manual download from the menu. Employees on remote sites or off-site can also be enabled to clock in on a laptop or smartphone using web clocking if required. Find out more about clocking options for the Chronologic workforce management system.